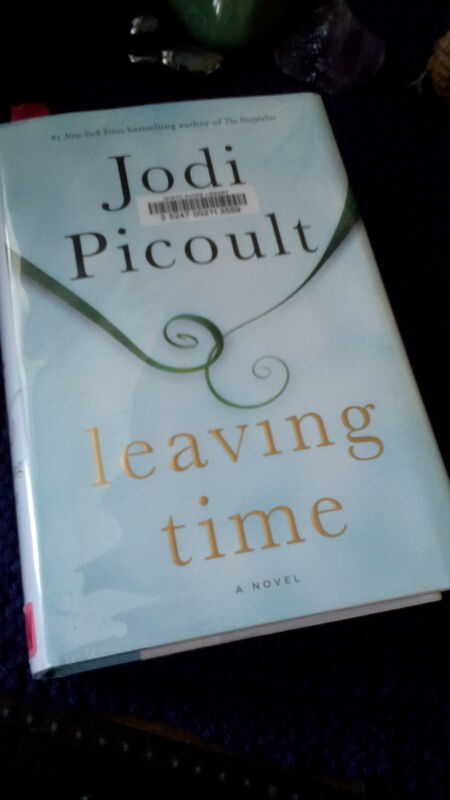 The library tells me have a scant week to read Jodi Picoult’s new novel, Leaving Time. The clock is ticking, and I’m only on page 8! Seems like the perfect time to continue learning the Lenormand, doesn’t it? Leaving Time is about a woman’s grief over the loss of her mother, a scientist who studied elephants but who then disappeared mysteriously, and her search to find her. Or so I gather from the jacket copy. 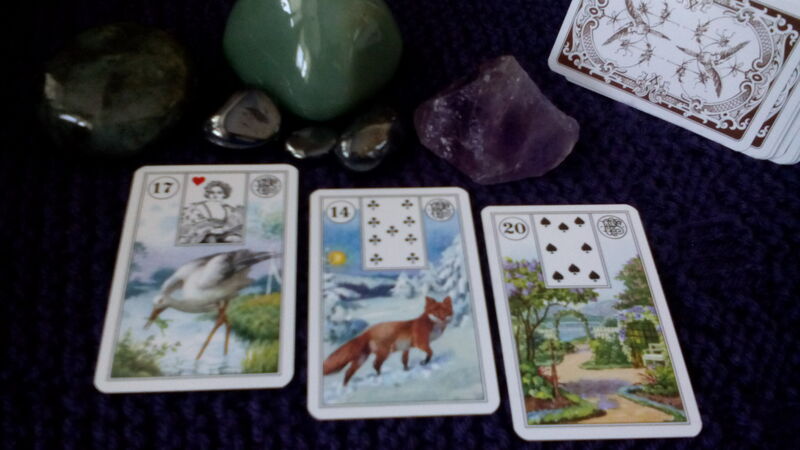 Asking the Lenormand what will happen in this book, I drew: the Stork, the Fox, the Garden. The Stork, the Fox, and the Garden…and notice, as well, the Queen of Hearts on the Stork card. Is that Alice, our protagonist’s mother? The Stork: my guess here is that, through flashbacks, we will early on find the story of the protagonist’s birth and/or early childhood. But storks also have to do with migration. Do elephants migrate? I have no idea! But that’s another possibility here. And finally: Not the Coffin, which would make me think that the protagonist will discover that her mother has died. But instead, the Garden, a meeting place–I think she will find her mother, and they will meet. I am inclined to think they will meet in person, but perhaps not–perhaps the meeting is a meeting of the minds, since I can also tell from the cover copy that she reads her mother’s journals. But I don’t think that’s going to be it. The Garden involves people in groups, public and private occasions, Rana George tells us (I’m referring to her Essential Lenormand as I study the Lenormand). I have this idea that Jenna, the protagonist, may find her mother giving a scientific talk in some public forum–though that also makes no sense, because surely she would have been in touch with her daughter if she were able to. Maybe I’ve just watched too many movies! So, I have a week to read before handing off the book to the next person who has requested it from the library, and will post an update below after I finish. So if you’re reading along with me–either finish before me, or don’t come back to this page until you have! as you might find a spoiler. But feel free to post comments if you are reading along–this is my “on the record” prediction of what will happen, so from the point of view of this as a learning exercise, you won’t spoil that by telling me what happens. Previous Who Is the Devil?